I just got back from a fabulous weekend in Florida with my gorgeous husband, Chapin. Although I flew out Friday afternoon and back home Sunday night, I still enjoyed every minute... though the weekend did pass in a gigantic blur. 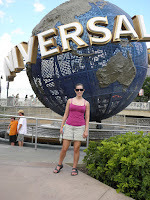 The highlight was our trip to Universal Studios Orlando. It was the first time we have ever visited a Universal theme park, so we were both very excited. As we were staying at a hotel in Tampa, we woke up at 6:30 a.m. on Saturday morning so we could get there soon after the doors opened at 9 a.m. (Tampa is about an hour and a half from Orlando.) We grabbed a quick breakfast at Starbucks and were soon on our way. Once we arrived and parked our car in the E.T. section, we decided to visit The Wizarding World of Harry Potter first. 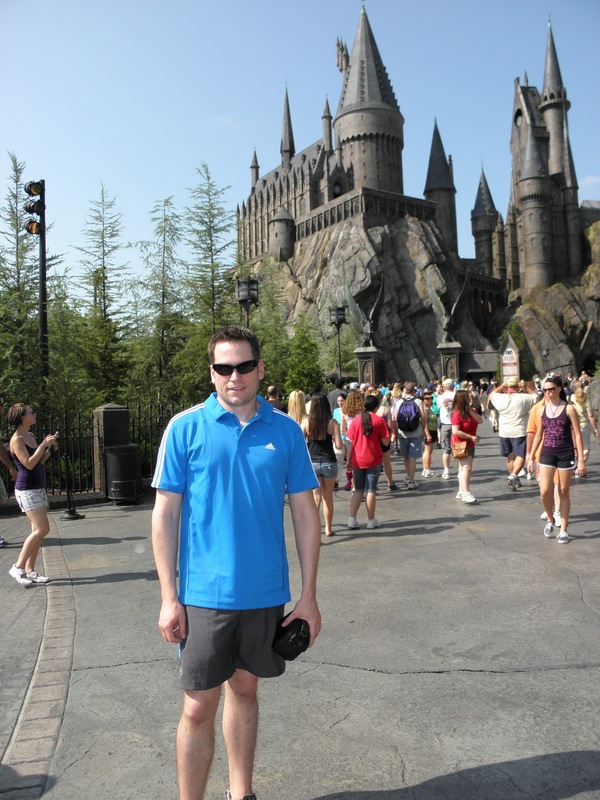 Chapin and I are both huge Harry Potter fans, so getting to see Hogwarts and the fictional town of Hogsmeade come to life (and not just on the movie screen) was a huge thrill. We browsed at Honeydukes (the candy store) and Zonko's (the joke store) as if we were Harry, Ron or Hermione. 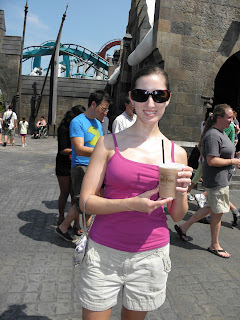 We tasted Butterbeer, the preferred (virgin) drink of the students at Hogwarts School of Witchcraft and Wizardry. Butterbeer tastes like cream soda with a hint of butterscotch. You can try two versions: the Soda or the Slurpee. Since the day was so hot, we opted for the latter... and it was delicious! We took a tour of Hogwarts and went on our own high flying broom adventure with Harry himself (via the Harry Potter and the Forbidden Journey ride). 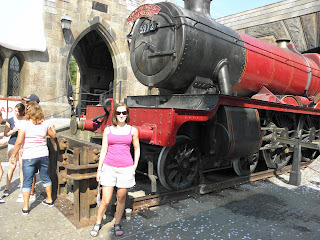 We rode a Hippogriff (on the Flight of the Hippogriff Roller Coaster) and participated in the Triwizard Tournament Dragon Challenge, two very fun roller coasters. Chapin is not a huge fan of heights or roller coasters, so getting him on a coaster during this trip was so much fun for me. I love riding roller coasters - you can hear me screaming and laughing simultaneously throughout the whole ride - so this was the first time I got to do it with my husband. He was a great sport, and I really appreciated him not letting me ride the roller coasters alone. Thank you, Honey! 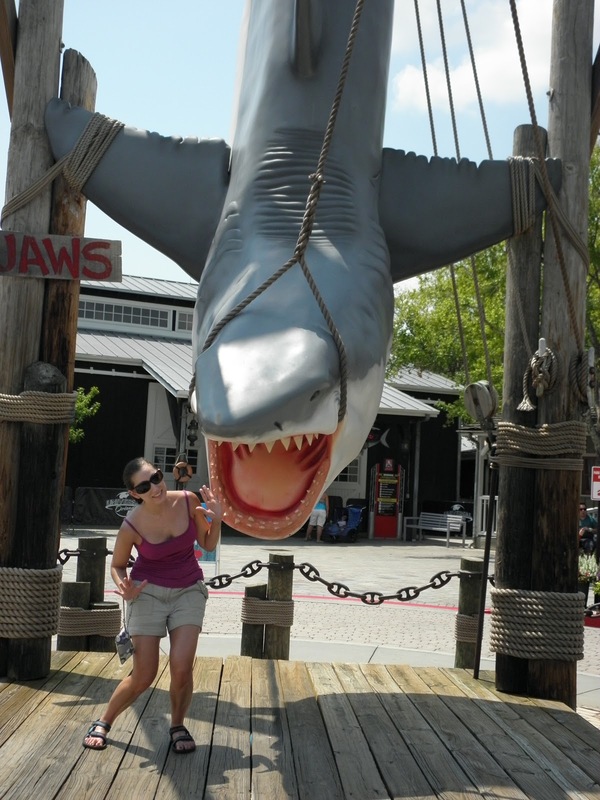 We also participated in some of the more classic rides, including the Jaws boat ride and Twister tornado demonstration. To be honest, we found both attractions pretty lame and not worth the wait. Fortunately, we paid a little extra for the Express Pass, so we were able to breeze through a lot of the lines. It's definitely worth it if you have limited time, like we did, to spend at the park. For lunch, we stopped at Emeril's Restaurant Orlando to enjoy a leisurely break in some air conditioning. I had yellowfin tuna tacos and Chapin got a HUGE turkey burger and fries. 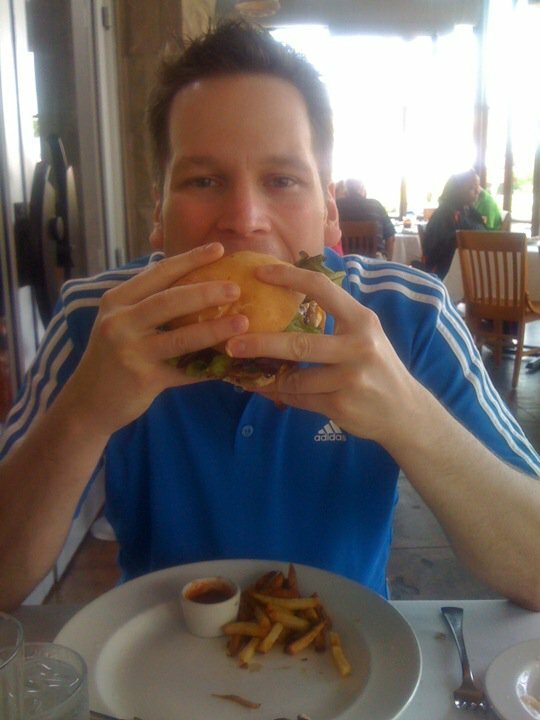 The fries came with some sweet, zesty ketchup that was delicious. You gotta love Emeril! BAM! I enjoyed the Revenge of the Mummy indoor roller coaster and the Incredible Hulk Coaster. We skipped all the water rides, the little kid areas, as well as Doctor Doom's Freefall, which held no interest for either of us. In the afternoon, we tried to do some of the indoor activities, like the Disaster motion picture... starring YOU! Chapin was picked from the audience to be part of the "cast," so that was really fun for us. I laughed so hard seeing him up there. He was a great actor, though. He had to act "scared" while sitting in a pile of green balls that they later green screened out so it looked like he was in water. It was really neat, and had they been selling the final video, we probably would have bought it. The scariest ride was the Hollywood Rip Ride Rockit. You start off going straight up and then straight down again, and I almost chickened out. By this point, Chapin was starting to actually enjoy riding the roller coasters, so he talked me into it! I wish a I had a picture of our faces as we went up that hill, too. I'm sure they were classic. One way this roller coaster is different: you get to choose music to listen to while you enjoy the ride. I chose Fergie's "Glamorous." I know all the words, so it was comforting to me. It also reminds me of my sister, Gail's, wedding, since she got married when that song was really popular (Summer 2007). 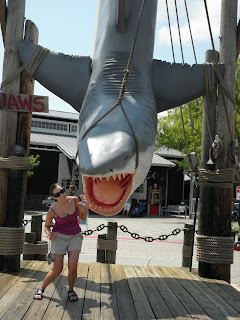 Well, that's the rundown on our trip to Universal Orlando. It was very hot, and I was a sticky, sweaty mess most of the day, but it was worth it. I love this! I'm glad you got to spend the weekend with Chapin. Looks like you guys had a lot of fun!